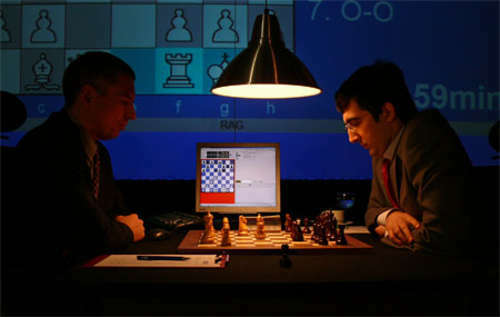 12.05.06 Game 6 was an interesting and complex affair with both players making deep, far-sighted plans. After forty-six moves with lots of material still left on the board, Fritz played 47.a4 and Kramnik offered his hand. 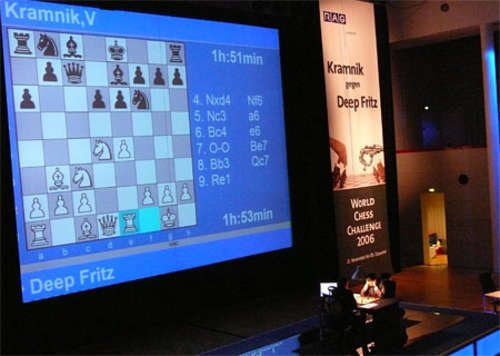 A great success for the Deep Fritz team and a great effort by World Champion Valdimir Kramnik. 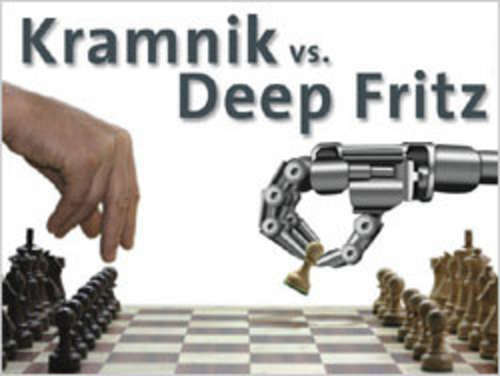 Final match score: Kramnik 2 - Deep Fritz 4. Kramnik battled on but in the end it was Deep Fritz who eeked out the win. Replay Game 6 here. After loading the game you can use the controls at the bottom of the notation window to play, pause and advance the game move by move. 1.e4 c5 2.Nf3 d6 3.d4 cxd4 4.Nxd4 Nf6 5.Nc3 a6 6.Bc4 e6 7.0-0 Be7 8.Bb3 Qc7 9.Re1 Nc6 10.Re3 0-0 11.Rg3 Kh8 12.Nxc6 bxc6 13.Qe2 a5 14.Bg5 Ba6 15.Qf3 Rab8 16.Re1 c5 17.Bf4 Qb7 18.Bc1 Ng8 19.Nb1 Bf6 20.c3 g6 21.Na3 Qc6 22.Rh3 Bg7 23.Qg3 a4 24.Bc2 Rb6 25.e5 dxe5 26.Rxe5 Nf6 27.Qh4 Qb7 28.Re1 h5 29.Rf3 Nh7 30.Qxa4 Qc6 31.Qxc6 Rxc6 32.Ba4 Rb6 33.b3 Kg8 34.c4 Rd8 35.Nb5 Bb7 36.Rfe3 Bh6 37.Re5 Bxc1 38.Rxc1 Rc6 39.Nc3 Rc7 40.Bb5 Nf8 41.Na4 Rdc8 42.Rd1 Kg7 43.Rd6 f6 44.Re2 e5 45.Red2 g5 46.Nb6 Rb8 47.a4 1-0. Really it's a win for the human race too.